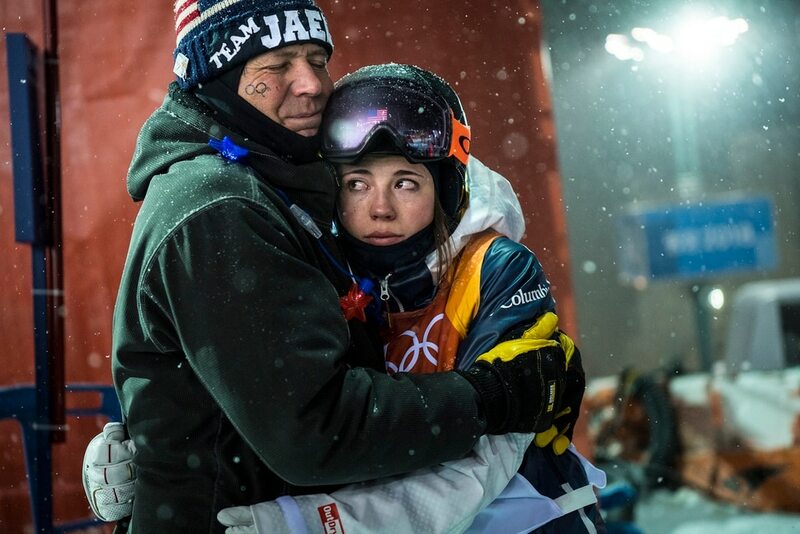 (Chris Detrick | The Salt Lake Tribune) Park City's Jaelin Kauf hugs her step-father Squeak Melehes after competing the Ladies' Moguls Final at Phoenix Park during the Pyeongchang 2018 Winter Olympics Sunday, February 11, 2018. Kauf finished seventh with a score of 76.03. (Chris Detrick | The Salt Lake Tribune) Park City's Jaelin Kauf competes in the Ladies' Moguls Final at Phoenix Park during the Pyeongchang 2018 Winter Olympics Sunday, February 11, 2018. Kauf finished seventh with a score of 76.03. (Chris Detrick | The Salt Lake Tribune) Park City's Jaelin Kauf competes in the Ladies' Moguls Final at Phoenix Park during the Pyeongchang 2018 Winter Olympics Sunday, February 11, 2018. Kauf finished seventh with a score of 76.03. (Chris Detrick | The Salt Lake Tribune) Park City's Jaelin Kauf competes in the Ladies' Moguls Final at Phoenix Park during the Pyeongchang 2018 Winter Olympics Sunday, February 11, 2018. Kauf finished seventh with a score of 76.03. 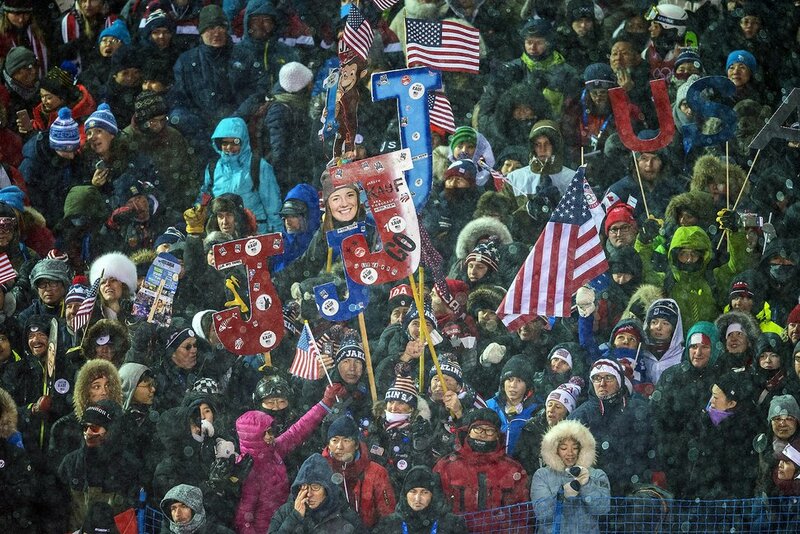 (Chris Detrick | The Salt Lake Tribune) Friends and family of Park City's Jaelin Kauf cheer as she competes in the Ladies' Moguls Final at Phoenix Park during the Pyeongchang 2018 Winter Olympics Sunday, February 11, 2018. Kauf finished seventh with a score of 76.03. (Chris Detrick | The Salt Lake Tribune) Park City's Jaelin Kauf walks away after competing the Ladies' Moguls Final at Phoenix Park during the Pyeongchang 2018 Winter Olympics Sunday, February 11, 2018. Kauf finished seventh with a score of 76.03. (Chris Detrick | The Salt Lake Tribune) Park City's Jaelin Kauf after competing the Ladies' Moguls Final at Phoenix Park during the Pyeongchang 2018 Winter Olympics Sunday, February 11, 2018. Kauf finished seventh with a score of 76.03. (Chris Detrick | The Salt Lake Tribune) Park City's Jaelin Kauf competes in the Ladies' Moguls Final at Phoenix Park during the Pyeongchang 2018 Winter Olympics Sunday, February 11, 2018. Kauf finished seventh with a score of 76.03. (Chris Detrick | The Salt Lake Tribune) Park City's Jaelin Kauf hugs fellow Park City moguls athlete Keaton McCargo after competing the Ladies' Moguls Final at Phoenix Park during the Pyeongchang 2018 Winter Olympics Sunday, February 11, 2018. Kauf finished seventh with a score of 76.03. McCargo finished in eighth place with a score of 75.79. (Chris Detrick | The Salt Lake Tribune) Park City's Jaelin Kauf competes in the Ladies' Moguls Final at Phoenix Park during the Pyeongchang 2018 Winter Olympics Sunday, February 11, 2018. Kauf finished seventh with a score of 76.03. (Chris Detrick | The Salt Lake Tribune) Park City's Jaelin Kauf competes in the Ladies' Moguls Final at Phoenix Park during the Pyeongchang 2018 Winter Olympics Sunday, February 11, 2018. Kauf finished seventh with a score of 76.03. (Chris Detrick | The Salt Lake Tribune) Park City's Jaelin Kauf skis away after competing the Ladies' Moguls Final at Phoenix Park during the Pyeongchang 2018 Winter Olympics Sunday, February 11, 2018. Kauf finished seventh with a score of 76.03. (Chris Detrick | The Salt Lake Tribune) Park City's Jaelin Kauf gets a hug from from her brother Skyler Kauf after competing the Ladies' Moguls Final at Phoenix Park during the Pyeongchang 2018 Winter Olympics Sunday, February 11, 2018. Kauf finished seventh with a score of 76.03. (Chris Detrick | The Salt Lake Tribune) Park City's Jaelin Kauf competes in the Ladies' Moguls Final at Phoenix Park during the Pyeongchang 2018 Winter Olympics Sunday, February 11, 2018. Kauf finished seventh with a score of 76.03. (Chris Detrick | The Salt Lake Tribune) Park City's Jaelin Kauf competes in the Ladies' Moguls Final at Phoenix Park during the Pyeongchang 2018 Winter Olympics Sunday, February 11, 2018. Kauf finished seventh with a score of 76.03. 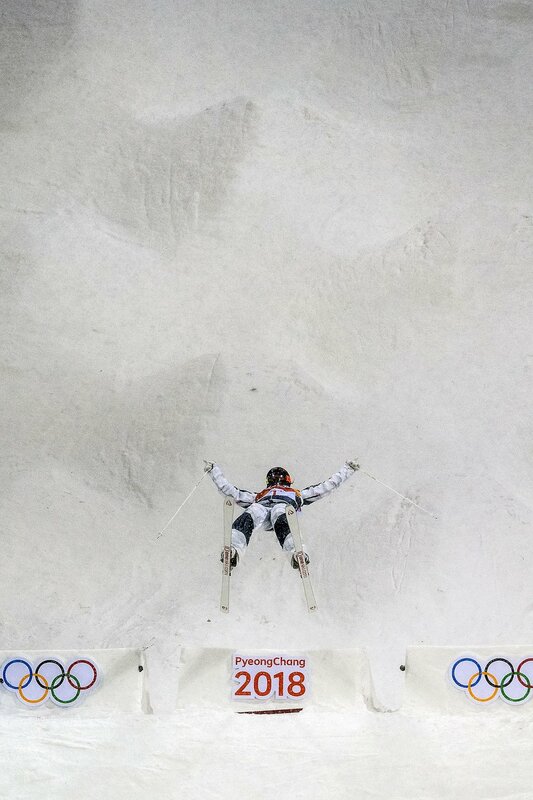 (Chris Detrick | The Salt Lake Tribune) Canada's Audrey Robichaud competes in the Ladies' Moguls Final at Phoenix Park during the Pyeongchang 2018 Winter Olympics Sunday, February 11, 2018. Robichaud finished ninth with a score of 74.89. (Chris Detrick | The Salt Lake Tribune) USA's Tess Johnson competes in the Ladies' Moguls Final at Phoenix Park during the Pyeongchang 2018 Winter Olympics Sunday, February 11, 2018. Johnson finished in 12th place with a score of 70.49. (Chris Detrick | The Salt Lake Tribune) France's Perrine Laffont competes in the Ladies' Moguls Final at Phoenix Park during the Pyeongchang 2018 Winter Olympics Sunday, February 11, 2018. Laffont won the event with a score of 78.65. (Chris Detrick | The Salt Lake Tribune) USA's Tess Johnson competes in the Ladies' Moguls Final at Phoenix Park during the Pyeongchang 2018 Winter Olympics Sunday, February 11, 2018. Johnson finished in 12th place with a score of 70.49. (Chris Detrick | The Salt Lake Tribune) USA's Keaton McCargo competes in the Ladies' Moguls Final at Phoenix Park during the Pyeongchang 2018 Winter Olympics Sunday, February 11, 2018. McCargo finished in eighth place with a score of 75.79. (Chris Detrick | The Salt Lake Tribune) USA's Keaton McCargo competes in the Ladies' Moguls Final at Phoenix Park during the Pyeongchang 2018 Winter Olympics Sunday, February 11, 2018. McCargo finished in eighth place with a score of 75.79. (Chris Detrick | The Salt Lake Tribune) Spectators watch the Ladies' Moguls Final at Phoenix Park during the Pyeongchang 2018 Winter Olympics Sunday, February 11, 2018. Pyeongchang, South Korea • Jaelin Kauf had her sights set on winning gold in her first trip to the Olympics. Instead, as the medals were being decided here late Sunday night, the world’s No. 1-ranked female mogul skier sat alone in the snow, talking to her boyfriend on FaceTime. “He always has great advice to give me,” she would say later, her eyes still red from crying. 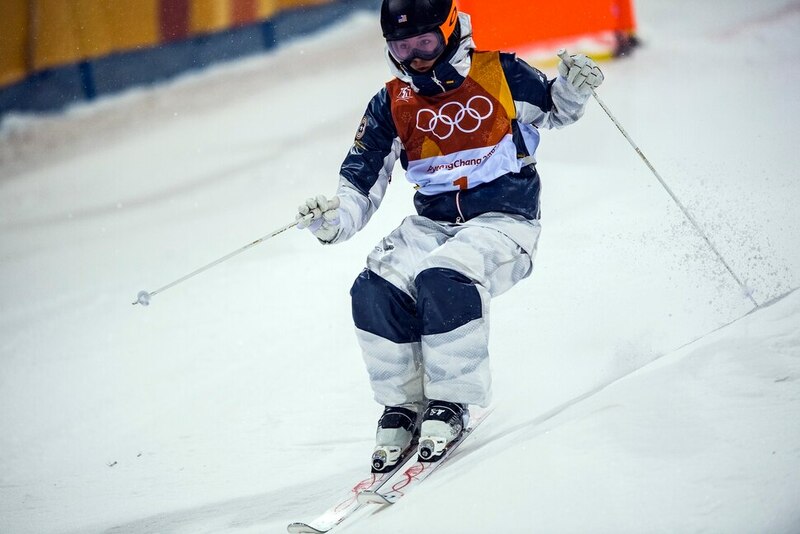 The U.S. women’s moguls team came to South Korea young and inexperienced but talented and carrying high expectations for themselves. None more so than Kauf, the 21-year-old, the new face of of American mogul skiing, a woman some believe could be the heir to two-time Olympic medalist Hannah Kearney. Kauf, from Park City, had envisioned herself atop the podium and celebrating with her friends and family. They waved signs, giant letter Js on sticks, and outsize cutouts of Kauf’s face. They hollered and rang cowbells. And then, in the cold and snow and wind, they went quiet. A bobble at the top of her second run cost Kauf dearly. Six skiers would advance to the third and final round of the knockout-style competition. Kauf finished as the top American in the competition, but her score of 76.03 was only good enough for seventh place. (Chris Detrick | The Salt Lake Tribune) Friends and family of Park City's Jaelin Kauf cheer as she competes in the Ladies' Moguls Final at Phoenix Park during the Pyeongchang 2018 Winter Olympics Sunday, February 11, 2018. Kauf finished seventh with a score of 76.03. Colorado’s Keaton McCargo, at age 23, counts as the elder statesman among the U.S. women mogul skiers. Tess Johnson, meanwhile, is still just 17 years old. In time, Kauf, said, their stumbles in South Korea will make them better. On Sunday night, though, there was mostly bitter disappointment. A stunned Kauf hugged her parents, both champion mogul skiers themselves, but only briefly. “I don’t think there was anything we could have said in that moment to make her feel any better,” Scott Kauf said. Then she walked off to the empty slopestyle course at the Phoenix Snow Park to sit alone and talk with boyfriend, former U.S. mogul skier Jeremy Cota. “I’m not all the way there yet, but [he helped] me to try to compose myself and think about moving past this and what I can do from here on out,” Kauf said. The women on the podium — led by gold-medal winner Perrine Laffont of France — had all been there before, Cota reminded Kauf. This wasn’t the beginning Kauf wanted, but it was still just the beginning. But there are other competitions ahead. World Cups. And, in four more years, another Olympics. “My career is not over today,” she said. (Chris Detrick | The Salt Lake Tribune) Park City's Jaelin Kauf competes in the Ladies' Moguls Final at Phoenix Park during the Pyeongchang 2018 Winter Olympics Sunday, February 11, 2018. Kauf finished seventh with a score of 76.03.